This page from the U.S. Dept. of Transportation booklet of budget highlights. Click above for the full document (pdf). Some very welcome news via the proposed budget released today by President Barack Obama: the budget includes $130 million to help fund two of Metro’s big rail projects: the Purple Line Extension and the Regional Connector. The budget allocates $65 million to both projects. This afternoon, the White House released President Obama’s Fiscal Year 2014 Budget. The budget request for the U.S. Department of Transportation (USDOT) is $77 billion, which is 6% more than the Fiscal Year 2012 enacted levels. Within the budget for the USDOT is $130 million in Section 5309 Capital Investment funds for our agency’s two New Starts projects, the Purple Line and the Regional Connector. 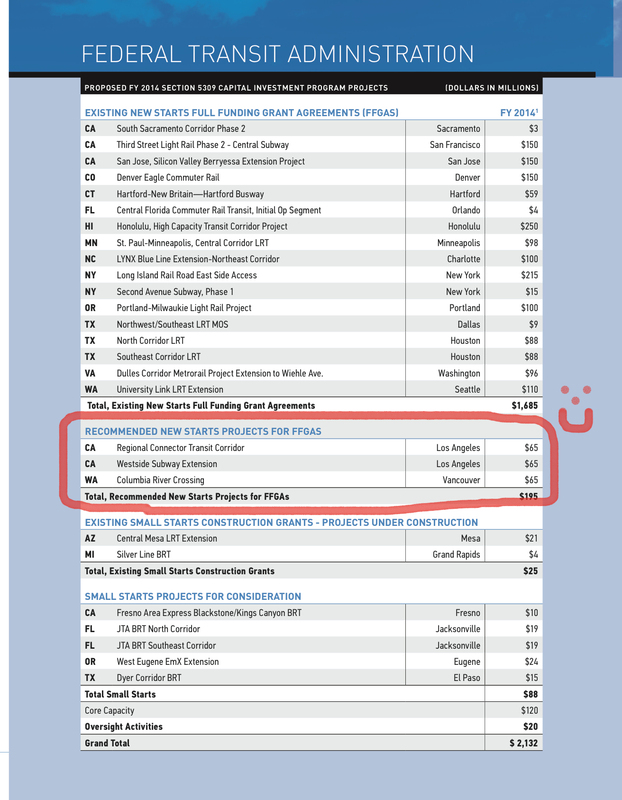 The funding recommendation for our New Starts projects can be found on Page 31 of this USDOT budget document – http://goo.gl/nhDyF. The budget released today also included an America Fast Forward Bond proposal, that while different in substance from our agency’s proposal, does seek to provide an additional financial tool to transportation agencies seeking to build major capital projects. Specifically, the White House proposal for America Fast Forward bonds includes an interest rate subsidy of 28%, while our agency’s Board approved America Fast Forward bond proposal includes a 100% interest rate subsidy paid for by the Federal Government. With respect to highway funding, the budget includes $41 billion for the Federal Highway Administration, which is consistent with the funding levels set last year by MAP-21. With respect to transit funding, the budget includes $10.9 billion for the Federal Transit Administration, which is over $300 million more than the Fiscal Year 2012 enacted level. In addition to the President’s commitment to fully fund MAP-21, the budget includes an ambitious $50 billion proposal to spur economic investment. This initiative, outlined on Page 4 of this USDOT budget document, includes $25 billion for roads and bridges, $6 billion to restore our nation’s transit systems to a state of good repairs and $4 billion for the TIGER grant program, among other initiatives. With the formal release of the President’s budget today, our staff will be carefully reviewing the document to fully understand its possible impact on our agency. Its a start, literally. Im so glad considering I live near Wilshire/Normandie, and a strait shot off my block down 7th street has a view of Century City. I’d love to see the day when i can walk out of the house and know I can get to that side in 15-20 minutes. So is this the Fast Forward funds that Metro needs to get these projects build in 10 years instead of 20? Great news if so! No, these are New Starts funds that will help Metro fund both projects. The Regional Connector was always scheduled to be finished in Measure R’s first decade or so; same with the first segment of the subway project. Funds from America Fast Forward — both a federal loan and bond program — will likely be needed in order to accelerate other Measure R projects. That’s a different pool of federal money. Hope that helps. Understanding this stuff is like understanding biochemistry. Don’t worry, Beverly Hills – you still have years and tens of millions of dollars to waste BLOCKING the subway. You are on the wrong side of history and your FOUR lawsuits against the subway only prove how irrational and uneducated your City Council/Mayor are. These Beverly Hills NIMBYs are worried subway construction will cause their local high school to be exposed to harmful gases and potential cave in of the streets above. How come this has never happened at other locations world-wide? Just an excuse to preventing low/middle class people from having easy access to their city because most people arent willing to sit in all that traffic congestion to pay a visit to the 90210. As we all know, rich poeple dont necessarily need nor use public transit. Why do I have a feeling that all these money will just ed up being dried out in endless meetings and studies? You all know all they do is waste them in yakkings instead of shoveling. I think Beverly Hills just doesn’t want “undesirables” in their neighborhood, as if the unwashed masses will come in once the subway works. Little do they know that educated, high income people are turning to mass transit in droves, and this will only accelerate. Automobile-exclusive transit is broken and doesn’t make sense anymore.